filter minimizes wind and breath "pop" noise. A cardioid pickup pattern isolates the main sound source while minimizing unwanted background noise. 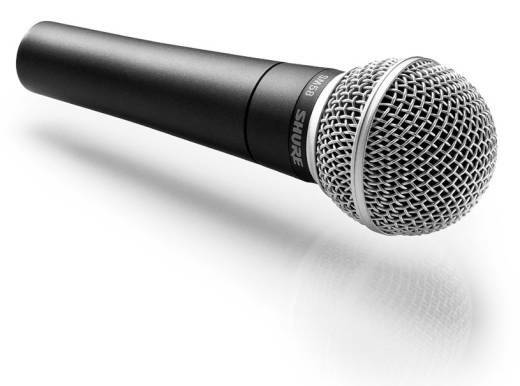 A sm58 is a great mic but the Sennheiser e835 is just better. better pickup and a better range. flatter and looks better. The e835 is just better. I've used these guys since the mid 70s. No wonder they haven't changed. Live and studio. Great mic for many applications and great price too. Although I use other types for various reasons, there has never been a disappointment with this guy! I use it for close micing my guitar cab (Mesa 2x12). The SM57 is supposed to be the cat's meow for this application, but it took me forever to find a spot on the speaker where I had a useable tone. With the SM58, I could stick it pretty much anywhere but dead centre of the dust cap and I got a great tone. This is for higher-gain metal rhythm tracks. I use it for recording vocals as well as skype calls because why not. Works great for everything. Its the industry standard for a reason, worth the money if you got it!